Riad Karmela Client Comments, Reviews and Testimonials. 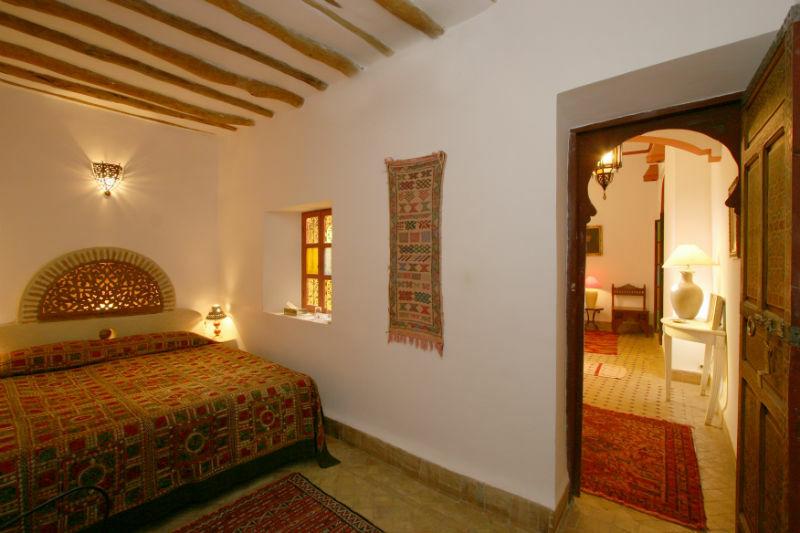 Book Riad Karmela Today with Hip Morocco - Holiday Accommodation in Marrakech, Morocco. "A peaceful retreat and a friendly oasis..."
A glamorous riad with 19 rooms located at 8 minutes from the Jemaa El Fna square and 2 minutes from the souks and the Marrakech Museum. The riad offers a very calm and relaxing atmosphere on his 3 patios,all connecting to each other. The first is the main one with four orange trees, a large fountain and breakfast and diners are provided there in the winter. In the second patio you will have access to bedrooms and Junior Suites but also to the hamamm and massage room. The third patio which is blue is called "Petit Karmela" as it may be privatised with 6 Bedrooms. They all are part of the Riad Karmela. The three terraces are connecting and you will find several areas to relax and enjoy the sun surrounded by Bougainvillea and Jasmines. During the summer, the breakfast and dinner are served on the terraces. You will find a traditionnal Morrocan Hammam , a Steam Sauna and 2 massage rooms. Proffessional masseurs are available to provide Hammam sessions and "scrub" and also massage done with top quality Argan oil. We can also offer a jacuzzi, organised tours, free Wi-Fi, bar, restaurant and we recommend your transfer from the airport! Breakfast is served in the main courtyard in the winter and on the terrace in the summer, mainly traditional Moroccan food. We are happy to organise day trips and make your stay a memorable one. At 30 km from Marrakech, the road enters a green valley and you will discover the picturesque berber villages, perched on mountains overlooking the torrent. The road ends up to Setti-Fatma village surrounded by a hundred years old walnuts trees, where you can enjoy delicious tagines after admiring the 7 waterfalls. The first waterfall is about 20 mn walk from to the river. It is possible to go higher but it will get more and more challenging. Sport shoes are necessary...On Mondays, you can also stop at the local Berber Souk of Tnin. At about one hour drive from Marrakech, after having crossed the gorge of Moulay Ibrahim, you will discover the village of Asni, nestled in the olives and almond trees. Then you will follow a long path of 17 km that will take you to Imlil, a remote village, built at the bottom of the beautiful gorges at the foot of Mount Toubkal (4167 m), the highest peak in North Africa. When you arrive there, a guide will take you for a one hour walk in the mountains. Lunch will be served in the local guide's Berber house and proper walking shoes are required. On the way back to Marrakech, you will use another route through the Kik Vallée. The most beautiful site of the Middle Atlas is at 156 km away from Marrakech. To shape these magnificent waterfalls, the torrent makes a fall of 100 m height in a pan of chalky rocks, a basin surrounded by a lush landscape populated by a colony of macaque monkeys and birds. At the top of the falls, close to the impressive gorge, lies a dozen antique small grain mills, still in business thanks to the torrent of water. You can have a lunch in a picturesque berber hostel. At a 2h30 drive stands Essaouira, a city fortified by Vauban. Located in an exceptional place on the seaside of the Atlantic and on a rocky peninsula in front of the waves, this former Portuguese city surprises by its unique architecture, its houses with blue shutters, its fortifications crenellated and its cannons pointing towards the ocean. "Coup de foudre" insured in a very calm city. The Kasbah of Ait Ben Haddou, precious bead of Morroco, is located at 176 km from Marrakech and is a classified heritage of humanity by UNESCO . The day is rich in discoveries with the crossing of the Col du Tichka (2260 m) and its many landscapes..The travel time is around 3 hours.. The town of Ouarzazate is the hub for visiting the south, it is known for its film studios where many films are shot each year. It is also the way to the desert but it requires another 3.5 hours so a trip in the desert has to be one night stay..as 8 to 9 hours drive. "I have been to Marrakech a couple of times before and stayed in riads that were considerably more expensive than Riad Karmela. 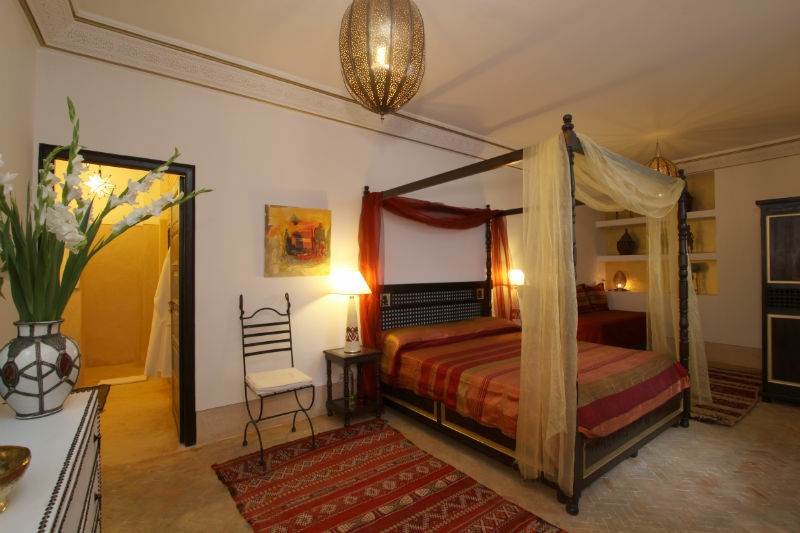 We were delighted with our experience at Riad Karmela. It is right in the centre of all madness that makes Marrakech so unique. so really easy to get everywhere and yet It really is a calm oasis to retreat to when you need a break. The rooms and courtyards are well decorated and there is a lovely roof terrace to soak up some sun. Joel and his team are so welcoming, nothing was too much trouble, they even provided my niece with a pair of trainers when she discovered she had forgotten to pack hers! 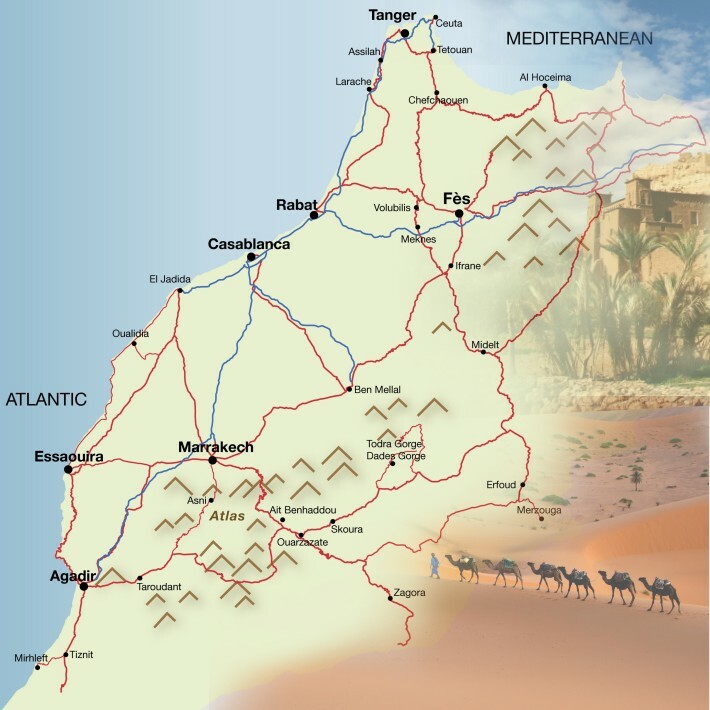 We used the riad to organise day trips for us to Essouira and to the Atlas mountains. Both trips were fantastic and represented good value for money. Mohammed, our driver on both trips was charming and a really good safe pair of hands on the wheel which was most appreciated! Our trip to the Atlas mountains was particularly special as we had a guide to lead our hike which included lunch in his home, in a small berber village with delicious food and a view of the mountains to die for ! The dinners we had at the riad were also delicious and so relaxing sitting on the roof terrace away from all the frenetic activity outside! All in all I would definately recommend Riad Karmela and would like to thank Joel and his team for helping to make our trip so memorable." "This is a fantastic Riad placed in the middle of the Medina in Marrakesh, and its a short but exiting walk away from Djema (La Place ). The hotel will pick you up from the airport and guide you to the hotel. You will feel so welcomed in this beautiful calm place and they will help you with everything. Our luggage didn't arrive and the help we got from said and Joel was exceptional. They took us to the souk and helped us buy som clothes etc. called the airport for two days and finally took us to pick it up when it arrived. I can not recommend this place enough. You will absolutely love it! If you go to Marrakesh then promise to stay in Riad Karmela." "This was our first trip to Marrakech. We were led by our taxi driver through the alley ways of the medina towards Riad Karmela which is tucked away behind a small ornate wooden door. It is worth mentioning at this point that I am not sure we would have found the Riad on our own - highly recommend getting a transfer from the airport! The first thing to strike us as we entered the Riad was the sense of calm and tranquilty, it really is a cool oasis set in the heart of the medina. We were welcomed by Bouchra who brought us mint tea and a plate of traditional Moroccon sweet treats before talking us through a map of the medina to help us to get our bearings. 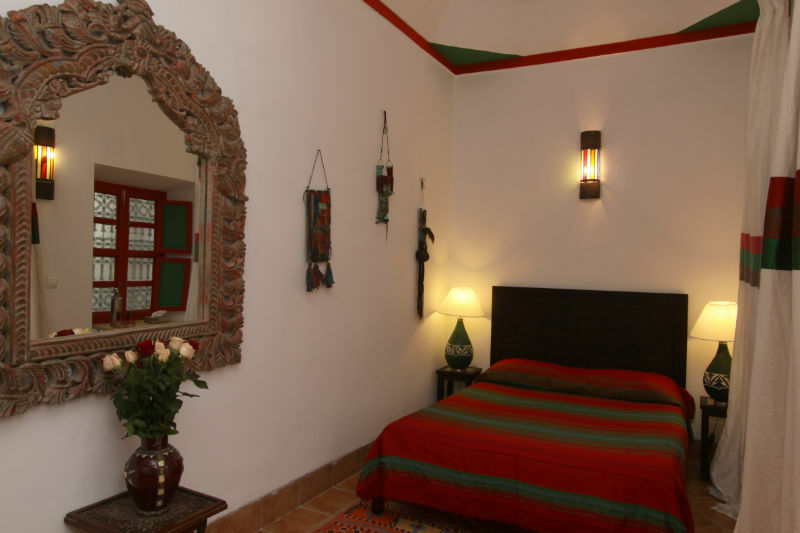 Riad Karmela is perfectly located, a short walk from Jemaa el-Fnaa (the main square) and the souks. Our room was cool, comfortable and nicely furnished. There are lots of places throughout the Riad to sit and chill out but if you want to lay out in the sunshine the best place to go is the roof terrace which has sun loungers and little areas tucked away to provide privacy. There is also a plunge pool up there which was needed after sitting in the 110 degree heat for an hour! We would highly recommend this lovely place and I am sure we will be back at some point in the future." 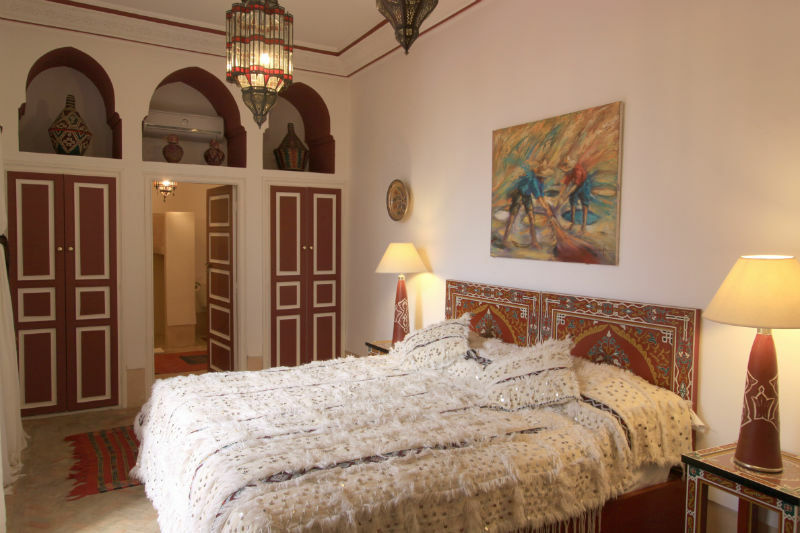 Located at 8 minutes from the Jemaa El Fna square and 2 minutes from the souks and the Marrakech Museum. 2 Standard rooms situated on the main patio with ensuite shower room. 1 double bed or 2 twin beds. View over the patio. there are 6 superior rooms distributed between the 3 patios on the ground floor or first floor. Ensuite shower rooms and hair-dryer. Safe, air-conditioning. 1 double bed or 2 twin beds. Certain rooms have 1 double bed and 1 simple bed, so can sleep 3 adults. The nine Junior Suites are more spacious and are distributed between the 3 patios on the ground floor or first floor. Ensuite shower rooms and hair-dryer, bathrobes. Safe, air-conditioning. 1 double bed and 1 single bed. Certain suites have 3 single beds and can sleep 3 adults. There are 2 apartment with 2 separate rooms and a sitting room. One room has a double bed and the second has 3 single beds. Can sleep 4-5 persons. Ensuite bathroom with shower, hair-dryer, air-conditioning, safe. The base rate price at Riad Karmela is in pounds, euros, or Moroccan dirhams and exchange rates are approximate.